The HITS Ocala Winter Festival has come to an end, with some of the top riders in the world making it a week to remember. This week, professional riders from all over the world joined us at HITS Post Time Farm in Ocala, FL to compete for over $1 million in prize money. On Wednesday, the $35,000 Welcome Stake took place, kicking off our first FEI week. McLain Ward and HIJA VAN STROKAPELLEKEN took home the first place award with a round-one time of 59.31. Second place went to Darragh Kenny and CASSINI Z with a round-one time of 60.28. Less than half of a second behind him was Fabio Leivas da Costa aboard TOSCA DE L'ESQUES with a round-one time of 60.92. Fourth place was awarded to Catherine Tyree and CATUNGEE with a round-one time of 61.76, followed by Lauren Hough and AGATHA D ECAUSSINNES with a round-one time of 62.68. McLain Ward and HIJA VAN STROKAPELLEKEN, jumping to a first place finish in the $35,000 Welcome Stake. In the $35,000 Thursday Prix, Brazil came out on top, with Yuri Mansur and VITKI in first place with a jump-off time of 38.39. Close behind, in second place was Felipe Amaral aboard GERMANICO T with a jump-off time of 38.56. 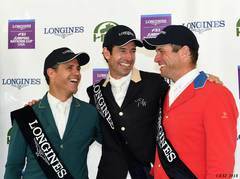 Third place was awarded to Ian Millar and VITTORIO with a jump-off time of 38.62. In fourth place was Christine McCrea aboard NEKTARINA B with a jump-off time of 40.47. 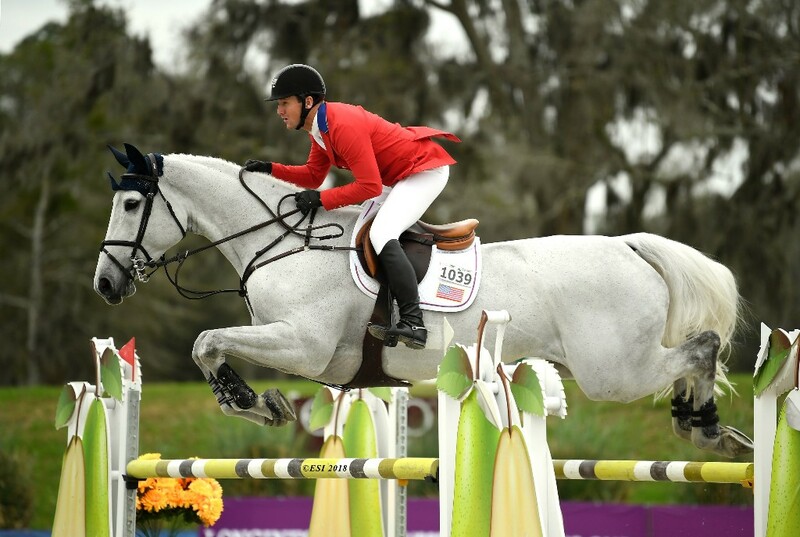 Rounding out the top five was Eric Lamaze aboard COCO BONGO with a jump-off time of 48.25. On Friday, the competition really began to heat up with the $265,000 Longines Grand Prix. The course proved to be a challenge for some, as only four riders came back to jump-off. With a jump-off time of 47.46 seconds, Rowan Willis made the Australians proud as he came out on top, winning the $265,000 Longines Grand Prix CSIO5* aboard BLUE MOVIE. "I broke her out and she has always been very fiesty, but I always believed in her. I would love to win a $1 Million Grand Prix with her someday" says Willis about his mare who carefully carried him through the difficult course. Devin Ryan came in second place aboard EDDIE BLUE with a jump-off time of 48.17 seconds. 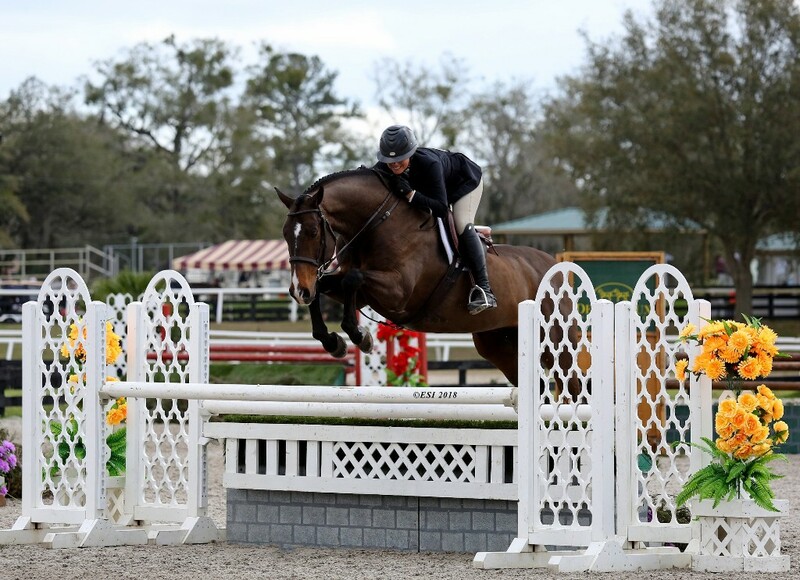 Ryan has already had much success this winter with this horse at HITS Ocala and proved to be a top contender for the USA. "Time was the biggest question" said Ryan when talking about the course. Course designer Marina Azevedo created the course for this event saying "I was happy with the results, although the time allowed could have been increased". Azevedo is a well-known course designer and had the opportunity to design her first 5* course for the Longines Grand Prix. "It was a good start" she said, referring to her 5* course. 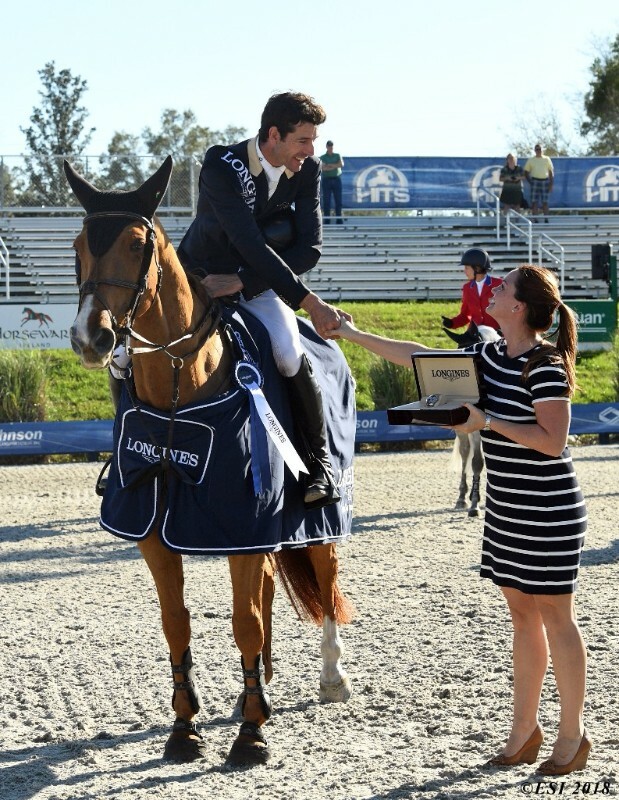 Third place was awarded to Rodrigo Lambre, representing Brazil, aboard VELINI with a jump-off time of 48.92. Laura Kraut came in fourth place aboard CONFU with a four-fault jump-off time of 49.25 for the USA. In fifth was Alison Robitaille and ACE, also for the USA, with a one-fault first round time of 74.44. Rowan Wills and BLUE MOVIE accept their Longines watch from Longines Representative Christina Welling, after winning the $265,000 Longines Grand Prix. On Saturday, Ireland saw a first place finish for rider Darragh Kenny and CASSINI Z with a jump-off time of 35.64 in the $35,000 HITS Classic. Just a second behind him was Wilheim Genn aboard BUGATTI with a jump-off time of 36.72. Third place was awarded to Yuri Mansur and VITKI with a jump-off time of 38.80. Laura Kraut took fourth place aboard JAKARTA with a jump-off time of 45.41 and fifth place went to Devin Ryan and COOPER with a four-fault jump-off time of 36.80. Following this class, the $25,000 SmartPak Grand Prix took place once again. After winning the $35,000 HITS Classic, Darragh Kenny came back again to win the $25,000 SmartPak Grand Prix aboard HORST VAN DE MIS PELEARE with a jump-off time of 32.047. Emanuel Andrade came in both second and fourth place aboard BOY IV and HARDROCK Z with jump-off times of 33.356 and a four-fault time of 33.535, respectively. Third place was awarded to Tracy Magness and INTENZ VAN HD with a jump-off time of 34.640. Rounding out the top five was Longines Grand Prix winner Rowan Willis aboard EVERSE W with an eight-fault jump-off time of 36.099. Cassandra Kahle and NINO NACHO, winning the $5,000 Devoucoux Hunter Prix. The Hunter rings also found success in week five with both the $1,500 Platinum Performance Hunter Prix and the $5,000 Devoucoux Hunter Prix, both taking place on Saturday. In the $1,500 Platinum Performance Hunter Prix Grace Debney came in first place aboard CARLA with a two-round total of 178. Second Place went to Maggie Astley and GATSBY with a two-round total of 167.5. Lila Ouellette and KING OF HEARTS took the third place award with a two-round total of 165. Fourth place was awarded to Kathryn Piper Martin aboard ANDIAMO with a two-round total of 164. Fifth place went to Kendall Meijer and HONEY CREEK with a two-round total of 163. Cassandra Kahle and NINO NACHO took the first place award in the $5,000 Devoucoux Hunter Prix with a two-round total of 170. Close behind her was Harold Chopping and CELTIC GOLD in second place with a two-round total of 168. Third place was awarded to Alex Stevens aboard SKY PILOT with a two-round total of 165. in fourth place was Jennifer Ritucci and QUIDAM'S REVEAL with a two-round total of 161. Fifth place was awarded to Libby Le Stage and SPECK-TACULAR with a two-round total of 156.5. Check out hitsshows.com for more information and classes to come in Week VII. Click here for a full list of Champions and Reserve Champions.